Clipper Poseidon - Boat rental? The Poseidon is a two-mast clipper fitted out for sailing with guests. As well as having a regular crew on board, facilities include a cosy saloon, spacious cabins, showers and an well-equipped galley. Our home port Harlingen opens out into the beautiful sailing area of the Waddenzee. The Waddenzee reaches from Den Helder to the Eems between the offshore islands and the mainland. The western part of the Waddenzee has deep, wide channels well-suited to larger ships thus offering endless sailing possibilities while the eastern part with its narrow channels and numerous sandbanks makes sailing a real adventure. All the harbours on these islands are accessible to our ships. One hour’s sail away from Harlingen, through the Kornwerderzand locks, is the IJsselmeer, or the former Zuiderzee. This large sailing area, approx. 80 km long and 25 km wide has many small harbour towns which are well worth visiting. Routes and destinations are planned together with the crew. History: The Poseidon was built in 1903 by the Duyvendijk shipyard in Papendrecht. She was commissioned by the Swets family and added to their existing fleet under the name 'Zuid-Holland' (South Holland). The ship carried freight to and from Germany over the Rhine and was used for a long time to transport building materials for the construction of the Delta Works in Zeeland. For the last ten years she was fitted out as a motorship. The ship transported freight until 1997 when changes in the way cargo was consigned caused work to dry up for the owners of many of these small freighters. 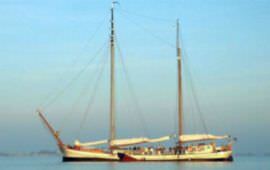 The ship is brought to Harlingen and was refitted and modernised into a charter sailing ship. She was taken into service in 1999 as the ""Poseidon"", God of the Sea . Interior: The ship can accommodate a maximum of 32 passengers. Measuring 36 meters, the Poseidon offers plenty of space above and below decks. The 'tween deck with wooden benches offers a safe, sheltered spot on board. The entrance to the saloon is located here. The saloon is spacious and furnished with four tables, and comfortable seating arrangements. The galley is fully equipped, with ample crockery and cutlery (inventory available on request), a 70 litre gas oven, a large fridge and freezer and a bar with a beer pump. The 12 two-berth and 2 four-berth cabins are furnished with spacious bunks (2.00 m x 0.75 m) complete with duvets. Each cabin has its own wash basin with hot and cold running water, clothes hooks and storage space for bags. The entire ship, including the cabins, showers and toilets, has central heating. 4 toilets 2 showers Extras: oven, radio and TV connections, CD player. Catering: We work together with caterers Le Chef, who specialise in supplying catering for all your needs on your sailing trips. There is a choice of welcome menus, day menus, half- and full-board in various price classes. Le Chef can also provide special menus for parties, wedding receptions or business events. Furthermore there is a beer pump on the Passaat for which you can order 30 litre barrels of beer on board.